A couple of Saturdays ago I went to the Smoragsborg in Williamsburg where I got together with some friends to start some celebrations, as my best friend had just graduated with her Doctorate. The place was packed so we all split off to find our own treats and meet back up at a picnic table. When I got back to the Picnic table I was asked what I had. "Well actually I went to tasting where they had 3 courses listed. First I had ....". They found it hysterical. I must admit I didn't expect this to be my lunch. Normally I go straight for Chick Pea & Olive for my beet burger, but as I was walking a stand caught my eye with a burlap runner and some daisies. The stand was called, "Von Kava, Flash Fine Dining" and they offered a 3 course tasting menu for $15.00 (I figured as long as it turned out to be good it would be worth it since I paid $12 for my beet burger anyway. Plus this was the adult in me expanding my pallet). Obviously the portions were going to be small but after reading everything it seemed I was in luck that everything was vegetarian (I did ask them if this was typical, they said that sometimes they do a vegetarian only, but usually there is some meat involved). While Andrew and my mother hovered for a minute I could tell they were antsy for their burgers, so I told them to go in search of their own food while I got ready for my "fine dining" standing meal. Fancy huh. First meal was a Spicy Green Gazpacho with candied Jalapeño Syrup and Cilantro. Normally I would not go for this as cold soup does not sound appealing to me but I LOVE Jalapeños so I was willing to give it the benefit of the doubt. It was delicious and refreshing and just a bit spicy. I ate it so fast I totally forgot to take a picture. 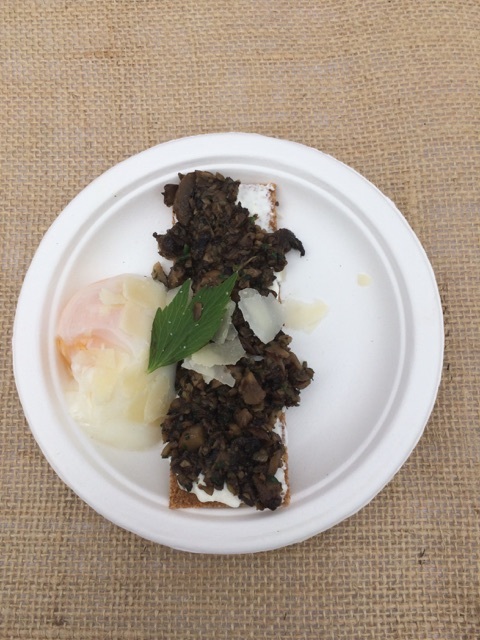 Next up was the Wild Mushroom Toast with a 63 degree egg, creme fraiche, debs lovage (at first I assumed this was an herb, then I re-read lovage and thought it was slang for the cooks love, I was assuming her name was Deb and the new way to say love in Brooklyn is lovage, but it turns out lovage is actually an herb. It is never a good thing when a women over thinks). I have mentioned before I am not a fan of mushrooms, but I was willing to take the risk. Totally worth it. The chevre was yummy and the mushrooms were sauteed to perfection. The egg I was told you dip into, but that seemed complicated and messy, so instead I cut up the yolk and placed it on each piece I broke off. I could seriously go for another right now. 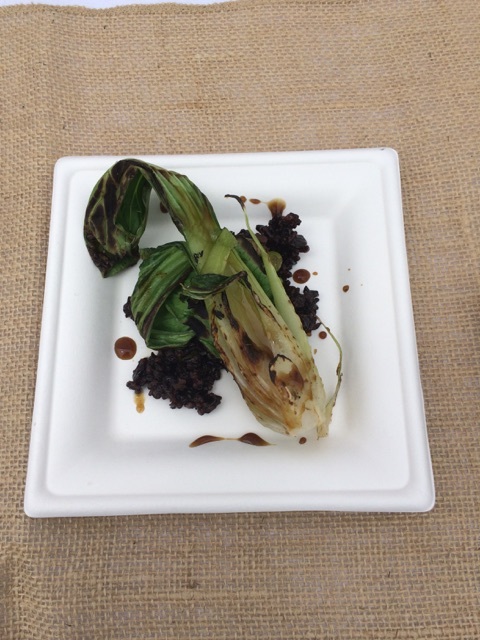 The main course was Grilled Bok Choy, maple-wasabi glaze, forbidden rice, black garlic & edamame. The rice and edamame were so flavorful and the Bok Choy was charred but still just juicy enough. I wish Andrew had been around to try, but alas I had to eat it myself (I wasn't really going to share, and if I did, it would be a REALLY small piece). Last they had a gelatin item, but since it was not vegetarian I passed. When I was back in town this past weekend I did check the menu to see if I could get in on the goods, but I saw pork on the menu so I walked away. This was definitely a fun and unique option and I highly recommend it if you want try a few different items for a decent price (everything is silly expensive at the smorgasborg). A quick article about them here and their instagram account to see the menu they are offering at their stands (no restaurant yet).